Last night, we were doing our usual routine of eating dinner and watching TV. We watch really bad TV. Stereotypically, one might think an artsy type and a doctor would enjoy a fine meal at their dining room table before retiring to a den to watch the History or National Geographic channel whilst smoking a pipe (me) and darning socks (him). Nah. Philip heats up a Lean Cuisine with a side of apple, peanut butter and cheese (marble monterey and colby jack ONLY--it's his equivalent of "no wire hangers!") and I make something on my F(l)at Belly Diet Plan. Anyway, we had just finished watching an episode of The Bachelor* when Philip randomly busted out the Full House theme song. HE STILL KNOWS ALL OF THE WORDS. Maybe I should amend that because I was just as impressed by the fact HE KNOWS ALL OF THE WORDS in the first place, much less has carried them through medical school and residency--no doubt, as he might say, replacing some particularly useful bit of knowledge about how to save a life. Further, I think he even did the shooby-du-wop-wop-ohh at then end. There is one of those at the end, right? Never at any point in my life have I known all the words to a theme song. I am just not one of those kinds of people (more on that some other time). But he is. It was awesome. I looked at him in his blue scrubs and mussed hair with love in my heart. 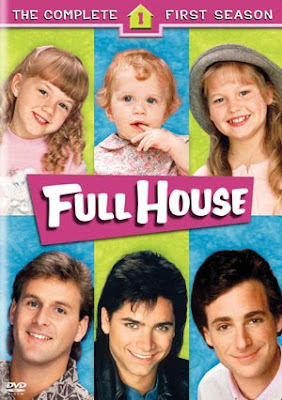 You know what else is lovely about him: had we found an episode of Full House on the tube right then he would have watched it with me even though he should study for his upcoming test. See husband, I can write a nice one!